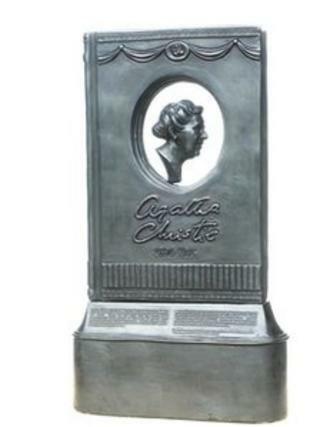 Planning permission has been granted for a 2.5m (8.2ft) memorial celebrating crime novel author Agatha Christie in London's theatreland. The statue will be positioned between Great Newport Street and Cranbourn Street, Covent Garden. Cast in bronze, it will feature a large book with an oval opening containing a portrait bust of the author, designed by sculptor Ben Twiston-Davies. Westminster Council granted planning permission on Wednesday night. The memorial will be erected by the end of the year. Covent Garden was chosen as a location because historically, eight theatres have shown her work in the area, most recently The Mousetrap at St Martin's Theatre. The play, which has been in the West End since 1952, is the world's longest-running stage production. It will celebrate its 60th birthday on 25 November with a gala performance.